Children often like to count the steps when they climb stairs but as adults we don’t even think about it; stairs are an integral part of most people’s everyday routine, they are taken for granted and not spared a thought. How many stairs must we have climbed or descended over the course of our lifetimes? Tens of thousands? Hundreds of thousands? More? 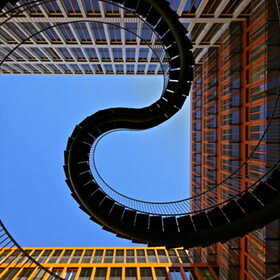 There are, however, staircases scattered across the globe that are so remarkable that people travel to see them. 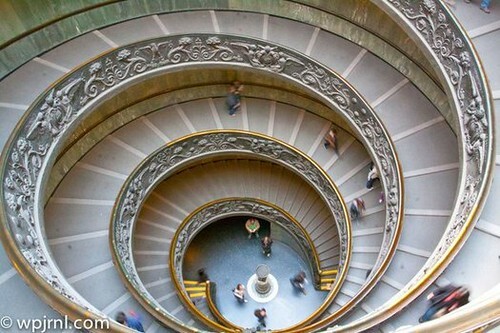 Let’s have a look at four of the most interesting staircases. One staircase to have captured the public’s attention is the stairs of the Vatican Museums, which were designed by Giuseppe Momo in 1932. These two spiralling stairs are in the form of a double helix, with one for ascending and the other for descending, and the balustrade is beautifully ornamented with elegant foliage designs and crests. Most people will agree that the splendour and beauty of the stairs is best admired from above. Jumping from the Vatican to Munich, we will find another visually arresting staircase, this time more modern and eternally unclimbed. The ‘Umschreibung’ (Rewriting) staircase was designed by artist Olafur Eliasson in 2004 and now stands outside the KPMG building in the city. 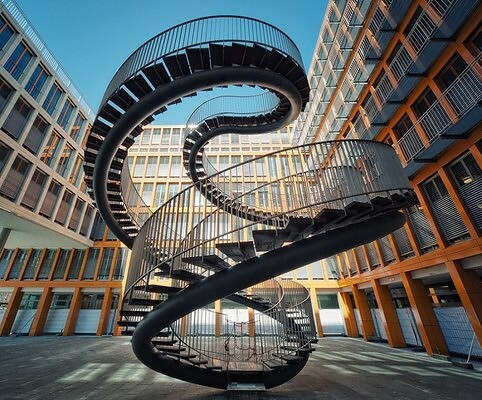 This stairs is a work of art rather than a functional stairs and it is reminiscent of the Penrose Stairs as its stairs lead nowhere, endlessly going up and down. The spiral staircase in the Loretto Chapel in Santa Fe, New Mexico, is notable for its masterful craftsmanship as the stairs was designed without a central support. The Sisters of Loretto consider the stairs to be a miracle. It makes two full revolutions and has thirty-three steps, a significant number because it was supposedly the age of Jesus when he died. The stairs’ creation is a bit of a mystery as the wood used is not to be found anywhere in the region and it is said that the skilled carpenter who created it disappeared before he could be paid. 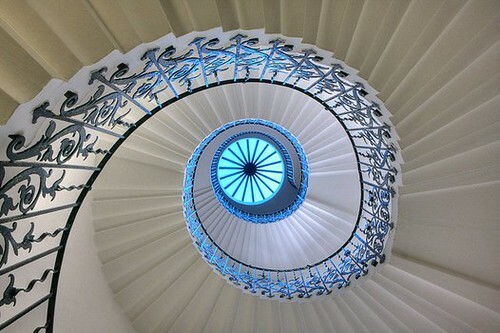 A final, notable staircase is the Tulip Stairs in the Queen’s House in Greenwich. The stairs does not rely on a central support but is cantilevered and its black bannisters depict beautiful, stylised flowers. This stairs is thought to be haunted, as a Canadian man holidaying in Britain in the 1960s took what has become one of the most famous photographs of a ‘ghost’ when trying to capture the beauty of the stairs. So next time you climb your stairs, take a moment to appreciate the mastery involved in its construction – it may not be the stairs of the Queen’s House, but then again at least your stairs isn’t haunted! This article was written by carpenter Gary Hughes on behalf of a leading stair manufacturer.